So, fellow fans, feast your eyes on some of the best Potter Sweets ever to grace our Muggle coil! I like the way the moon and clouds are supported by thin wires - such a great background touch. The aging on the book pages is *perfect*. A hat tip to the baker! This cake was motorized, y'all, with the top branch rotating so the snitches flew in circles! It also had a custom cake stand with hidden speakers that played the movie's theme song. WOW. Hit the link above for more pics and details. That must be one cool Granny. Love it. Submitted by Maggie B. and made by her friend, Lydia B. He even has his pink umbrella!! LOVE. Forget eating it; I want this displayed in my office! See the cauldron with the spitting flames? I want that one. Yeesh. Would you believe I'm only halfway through my Potter Sweets? Well, you know what that means: double feature! 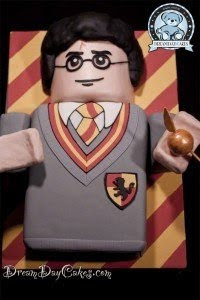 So tune in next week for more, and if you made a Sweets-worthy Potter cake this weekend, be sure to send it to Sunday Sweets [at] Cake Wrecks [dot] com. I have to admit I've (yet?) to get into Harry Potter, but even this muggle thinks these are great. I really like the Lego Harry Potter one. 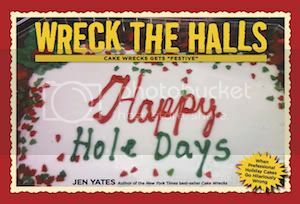 What a great idea for converting things into a more regular rectangular cake shape for easier baking and decorating - and so much better than the CCC attempts out there. You had me tearing up.I am so honored to share a birthday with Mr. Potter. Jen asked me what was on top of the horcrux cake while we were driving and I totally blew it. I think I was assuming it was all from DH and I don't remember a howler in that book. -10 geek points for me. Thanks to the 8 people who let me know and Wreck On! What's the symbol on the right of the Deathly Hallows cake? I made some steampunk-lite Deathly hallows jewelry for the premiere, but I don't remember that symbol at all! 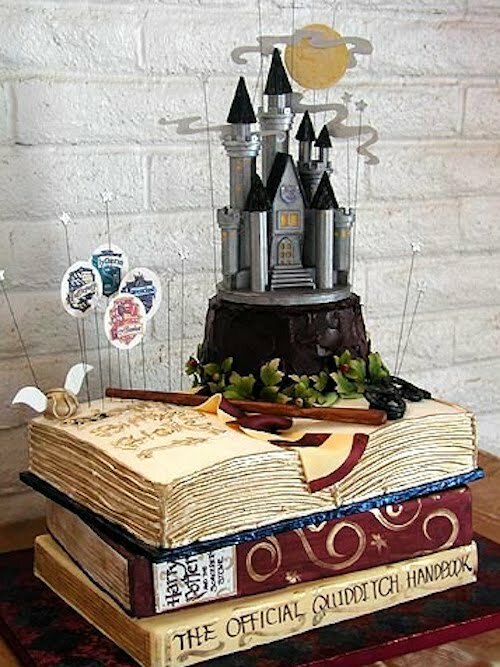 I love Harry Potter and all of those cakes were just amazing. My favorites, the Hedwig cake and Hagrid's house. Those seemed just perfect. I am totally with John. There wasn't a single good James Bond movie after "Doctor No". "Ciderhouse Rules" was a good attempt, but that had the author doing the screenplay. Generally, if I have read it I don't go to see the movie. @ Jill, it was a rune I found on a Harry Potter fan site, supposedly from a rune sheet from another book by Rowling perhaps? Not sure, I am looking for it again, as I didn't save my links from the internet. Hopefully, it's not a rune that doesn't fit the story. 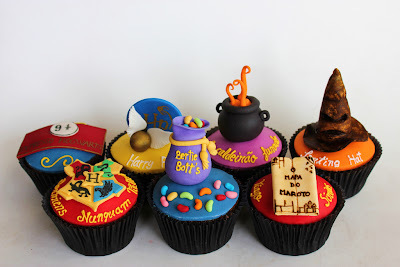 I think the cupcake with the Hogwarts crest on it is emblazoned with the Hogwarts motto, "Draco Dormiens Nunquam Titillandus" ("Never Tickle a Sleeping Dragon"). That's pretty awesome. And part of me is unwilling to believe that's not a *real* basilisk fang. These are adorable! Even though I'm not a Harry Potter fan (the books I mean, I've watched a couple of movies and they weren't bad). I love seeing well done cakes. Absolutely LOVE the Lego Harry! I agree completely with John. I hate when they make books I love into movies. First, because there's too much change from the way things actually went and second because I have the characters just right in my head and they rarely match the actors that get picked to play the parts. I think this may be my all-time favourite Sunday sweets. Can't wait until the second edition! 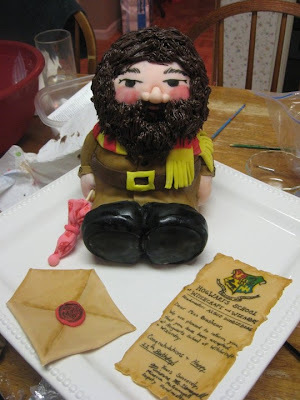 THANKS so much for featuring my friend, Lydia's awesome HAGRID Cake! She was so excited when I called her to tell her you put it on the blog! Isn't that crazy-talented?!!! I love these! So cute and imaginative. :D Looking forward to your 2nd edition. That is the cutest Hedwig ever, and I could never bring myself to eat the one of Hagrid's house; it's just too beautiful! Great selection. Those cakes are beautiful! I especially love the cupcakes. Hagrid's house is crazy good and the Hedwigs are precious. Here's a question about all those Sunday Sweets. How on earth can anyone possibly eat a cake that is so well done (and obviously expensive)? Thank Dumbledore you gave us HP for these Sweets. These were all great, but those cupcakes were so perfect my mouth dropped open. Freaking' wow! 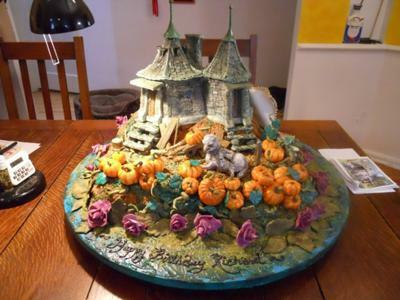 AH, that scale cake of Hagrid's hut is PERFECTION! 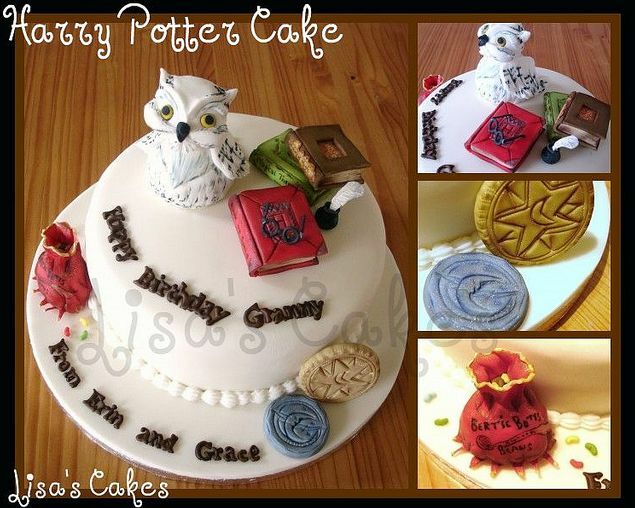 And the Hedwig cake? Adorable! i love Hedwig! Fantastic sweets! I think Ms. Rowling would be very pleased! I adore all of these. Long live Harry Potter!! Ok, I'll take one of each. -Μαρία Βάγκνερ, who hopes to celebrate the 23st of Jluy by finishing reading the Harry Potter series for the 23nd time. i like the acceptance letter with the hagrid cake. and being the nit-picker that i am, i must point out that the howler on the deathly hallows cake is from the second book/movie. if you look closely you can see a reference to harry & ron taking the flying car. Anyone notice that the Hogwarts express cupcake bears platform 9 1/2???? I noticed the adorable cupcakes are in Portuguese, and the ticket says it is for Platform 9 and 1/2. Can anyone confirm if the Portuguese translation changed the Platform number? Ohmy, I fell in love with those cupcakes. Darling!! They have a piece of my soul . . .
Also, I would LOVE to hear John's take on the movie. Seriously. What a great discussion *that* would be. The cake wasn't Deathly Hallows themed, it was a collection of all sorts of Harry Potter stuff. Bertie Bots beans, Gringott's coins (gold and silver), a Slytherin scarf, and the obvious things you see in the picture. Glad everyone likes it! Wow I want all the cup cakes just to stare at them. Cute! I haven't seen most of the movies so I don't know what I missed out on but these cakes are too adorable to eat! Oh wow, that first one... Awesome! The rest is pretty amazing to, but #1 is so great. I am with everyone about books turned into movies! I barely watched the first Harry Potter movie. The very sad part of my life is that I have a 12 and 10 year old boys that won't read the books! Love the Harry Potter cakes! Wonder what they tasted like though? An aftertaste of newt perhaps? That basilisk fang creeps me out. I loveloveloveloveloveloveLOVE cutie Hagrid!! Love. And since you totally called the cauldron cupcake, I call the one with the teeny tiny Bertie Bott's beans! So happy you're doing a HP double feature...can't wait to see the next round!! Awesome. 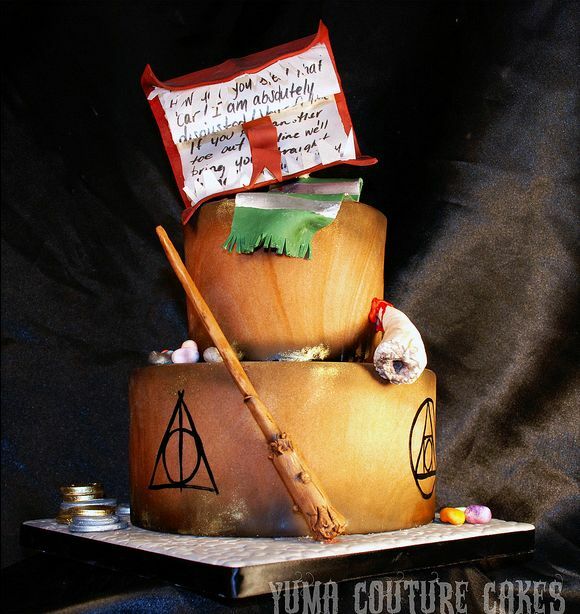 I think the 'best concept' award has to go to the Hagrid/acceptance letter cake, though. What better for an 11th birthday? I am especially astonished by the detail work on the books & parchment in so many of these cakes. How is it possible that these are cake? And who knew that Hagrid could look so huggably adorable? I want a stuffed Hagrid that looks just like that! Thanks for the H.P. collection. Yes, please, I WANT to get John started!! I do enjoy the movies, but I'm seriously grateful it's been four years or so (if that's even possible) since I read HP7, because even then I had "issues" at the theatre. And I'm not somebody who anybody dares go see movies with!!! Word Verification: eprot (I'm NOT making that up. I cannot believe that's my WV!!! What happens when a wreckerator tries to make Jen's Epbot robot. For the person who was wondering about the symbol on the Deathly Hallows cake, it is the "deathly hallows". There are 3 hallowed object, the cape of invisibility (the triangle), the resurrection stone (the circle), and the wand (the straight line). I think this is my fave entry---although it didn't make me laugh nearly as much as the others. 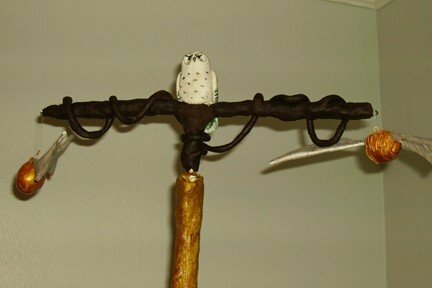 I'm so sad that Harry Potter is over...after the books I looked forward to the movies...now I'll be looking forward to next week's Sweets...Love that sorting hat cake and the little Hedwig...adorable! These are amazing!! Thanks so much for posting them. I want those cupcakes!!!!!!! Too adorable! The symbol on the RIGHT of the Deathly Hallows cake is the alchemical symbol for the Philosopher's Stone. You weren't wrong about the horcrux? cake...you didn't say that the cake was entirely from DH. 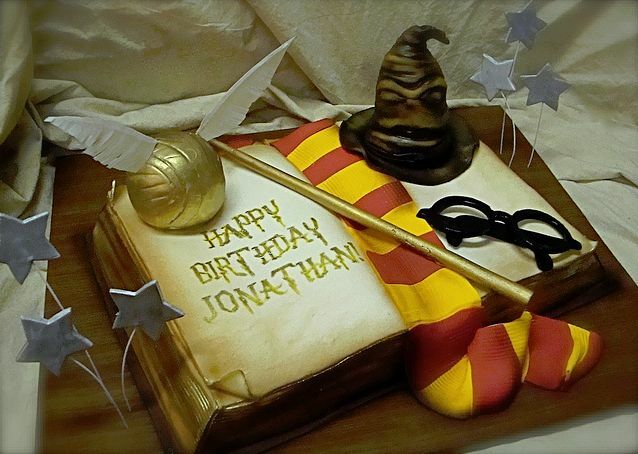 You only said the symbols were from DH, and asked if a cake could be a horcrux. 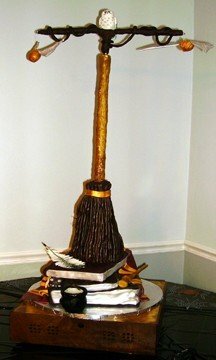 The basilisk fang is also from another book, so there were several books featured on that cake. I've gotta ask...what ARE the main parts of the cake supposed to be...wheels of cheese? Teak salad bowls? I really can't figure it out. 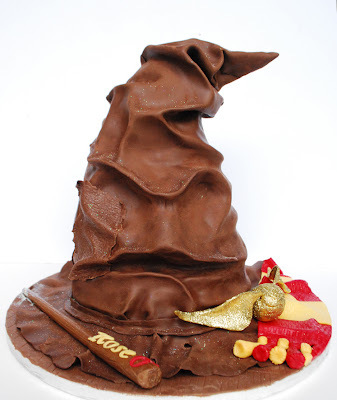 Also, not to be a party pooper (ha ha, I said poop), but the sorting hat on the second cake kinda looks like a tall, creepy pile of poop with a face. Perhaps if it had been a lighter color, like a tan. @Yuki J - the first HP book is actually pretty poorly written (perhaps the British version is better than the American version?) but the writing does improve with each book. You have to remember that Rowling's children were much younger when the first book came out, so it was written for young children. As Harry (and her children) grew older, the books were written for increasingly older audiences. By the time he was in high-school the the books were written on more of a high-school reading level. I don't think that cauldron is bubbling flames. I think it's supposed to be Felix Felicis. But it is cute. Yes, the Howler was from the second book, but you must remember that the horcruxes are throughout most of the books, not just the last one. All the cakes were awesome. I'm sad that HP books and movies are over, but they will still live on! Oh my god oh my god!!!!!!! I want those so badly!! I am such a huge Harry Potter fan!